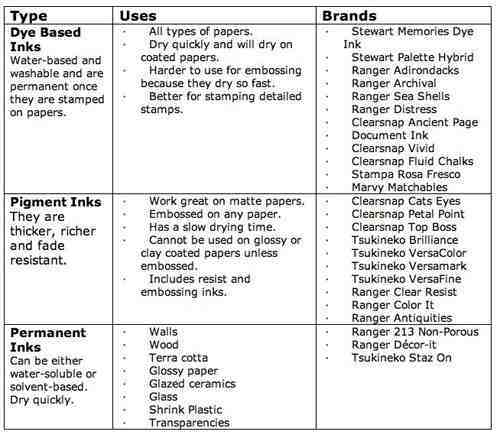 An overview of inkpads and their use. Generally, inkpads fit into 2 basic categories: dye based and pigments. There is overlap between categories however, as well as exceptions to the rule. When selecting inkpads, first determine the material it will be used on. This will be the biggest factor since each type couponrxsms.com/cialis-coupon coupon for cialis of inkpad have traits specific to it. Even two different companies can vary in color as well as application. I tend to have my favorites that seem to work well but I admit�I love collecting inkpads and will continue to search for new and different ways to use each one. Dye-based inkpads are made to be fast or slow drying and work best on glossy or coated papers. Smearing will occur if the ink is not dry, especially on glossy paper. Often, this type of ink needs to be heat set if wet mediums such as watercolors are going to be used. Be sure to test the inkpad on the paper you are using before starting a project. Dye-based inkpads may also fade over time. A favorite technique with dye-based inkpads is direct-to-paper. They also work well when a clear image is wanted or if you are over-stamping an image. I usually grab the Memories black, the Versafine black or the Document inkpad when stamping photo image stamps that are very detailed. Apply Adirondack dye inks to the background. 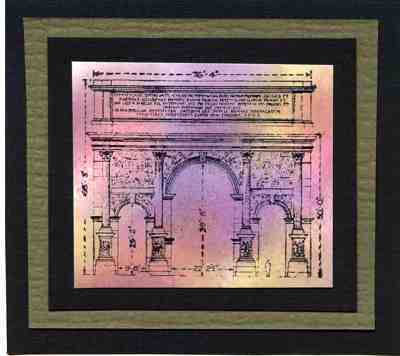 The arch 22- 066 was stamped with black permanent ink. Pigment inkpads are slow drying and contain glycerin, which keeps them moist for a longer time period. Pigment ink is thicker than dye-based pads. They provide the best coverage for textured paper but may dry on matte type papers if they are allowed enough drying time. 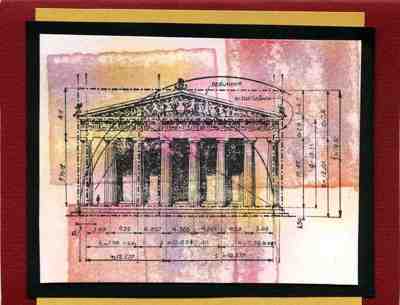 If pigment ink is applied to glossy paper, you will need to heat set it or emboss. Embossing pads fit under this category and can be clear or tinted. They provide a wet base for embossing powder. Versamark and Clear Resist pads can serve the same purpose as clear embossing pads. Pigment inkpads come in a wide assortment of colors, and in various sizes and shapes. They can be found in collections such as Colorbox Petal Points that combine similar families of colors. Pigment inkpads can also contain metallic that add glimmer and shine when stamped or used as a background. Brilliance inkpads have a unique quality and can also act as a resist pad when stamping. Versamark was used for the shadow stamping. Chalks and Pearl Ex were added with a cotton ball. Temple 22-023 was stamped with Black Staz-On. 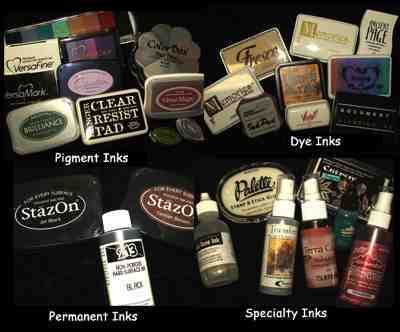 Permanent inkpads are solvent based and are meant for stamping on wood, glass, plastic, and glass. This type of pad is fast drying. Other places that you may need a solvent-based permanent ink would be when stamping on dominoes or transparencies. Be sure to heat set when stamping with these. A special solvent cleaner may be needed to clean your stamps when using this inkpad. 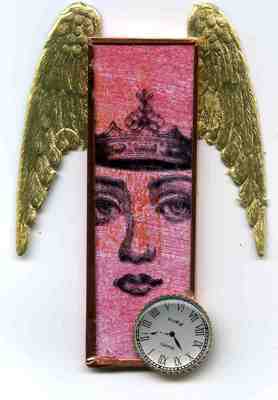 Black Staz-On was used to stamp Woman's Face 24-011 and Crown 42-131 on the front of the microscope slide and heat set. Inked pink paper is sandwiched between the slides. Chalk inkpads offer a richer, opaque type of color. Soft backgrounds are blended easily with these. They can be embossed and are permanent when heat set. Chalk inkpads work well in altered books backgrounds. Chalk inkpads vary in their wetness. Fluid Chalk is considered the wettest while the Antiquities inkpad seems to be dryer. Fresco inks were stamped with a shadow stamp on the background. 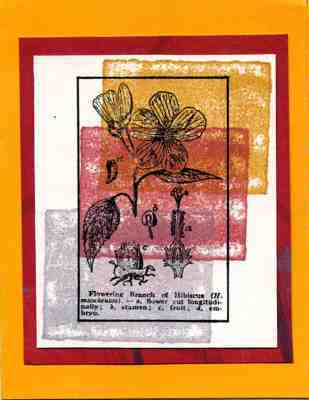 The Hibiscus Poster 34-067 was stamped using black Staz-On.